Where I got these new crabs is in Vauhan Mills Mall, just north of Toronto(Ontario). They specialize in Strawberries and apparently they are through the states also. www.craberriesusa.com I know a few of you were looking for strawberries. The new guys I got were small...by choice... but they had some there the size of a child's fist. I was all excited at first...but then I started looking at their site. While a small percentage of their info is good, almost all of their care info is wrong and even dangerous. They also sell crabs in painted shells. I don't mean to pinch on anyone's crabby parade, but I wouldn't have high hopes for crabs that come from these people. They don't have sub or temp/humidity accurate for most species, let alone straws & blues and if they think sand collapses & straight EE doesn't and that it's okay to shove crabs into painted shells....they don't have the proper education in hermit crab care. Plus, I don't know about whether a place like LHC would ship to Canada (I know HCP doesn't) but their prices are high for crabs in such conditions. For example, HCP keeps their crabs through at least one molt so they are healthy & acclimated to captivity before being sold. They also sell only freshly molted guys so that you have a higher chance of seeing your guys out more in the beginning of their time with you. I only paid $20 (plus shipping) for a giant jumbo compressus and they're prices are higher than LHC's. Is this where your other guys came from? Oh wow that is a heck of a find. Beautiful crab. It's sad when even people who look even more promising than most pet-stores turn out to be not the greatest after all. Well maybe not so great...but the one here in our area do carry natural shells also and while I am NOT a fan of painted...the gal said... that the paint they use is non toxic. And that the painted shells are what people are asking for and the natural shells are the last most often to sell. We do not have much of a selection and while some stores do sell hermits....not many. *There is no way for a pet store or supplier to know if the paint is non-toxic to hermit crabs as there is too little known about that sort of thing; especially a place that believes in keeping them in these conditions is the right way. *Crabs won't eat what they aren't supposed to, this includes paint. *The only time the paint itself is an issue is when the crabs are put into the shells while it's still wet & they get glued in. *The painted shells sell faster because the stores & customers don't know any better and think they are 'prettier'. *These crabs NEVER take a painted shell by choice. *They may get them from source (although in my experience, sales people don't usually even know where their products come from; only what their bosses tell them, nor does the average pet store employ their own harvesters), but those crabs weren't walking around the beach wearing a Spongebob shell. They are 100% of the time, taken out of their natural shells (by force, extreme temps or breaking the natural shell) and forced into the painted shells. This shows the 2nd half of that process. It's a really terrible process & business practice and I discourage even patronizing business who sell even the painted shells by themselves as it only enforces that industry. 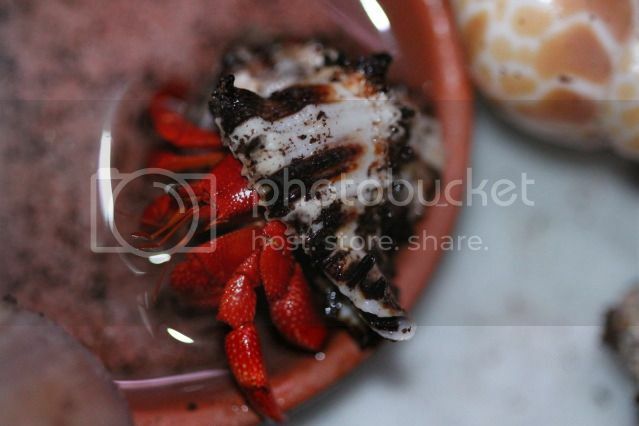 Over the years, I've had and heard of only a very few crabs that came in painted shells lived very long. I just feel very strongly about this because our hermie friends already have so many odds stacked against them before coming to us. With such a long life-span potentially ahead of them, why increase the chance of shortening it or contributing other crabs being treated this why by supporting the practice, ya know? *I didn't mean to offend/upset anyone; I just wanna get the word out is all. No hard feelings? I do not promote poor animal care. And the reason I took the one Blueberry is that I wanted it to have a home with less numbers and this fellow had been there for a moth. While not idea....this vendor seemed to offer good care of the critters in her care. Maybe that they had as many natural shells is an indicator that more people understand and request them. As for colors (not sure if you're referring to just the violascens, or what), most species are a different color when they are younger than they tend to be when they get older, but color is greatly affected by diet and conditions. For example, you don't often see red compressus; but the ones I have living with my perlatus (who get lots of red, color-enhancing foods) are turning reddish brown instead of grayish brown. Oh my gosh! I was whistling as I was reading & when I got to your first picture, I literally stopped, mid-whistle, with my mouth hanging open! What a crabtacular straw! SO pretty! (I like those murex ramosa shells, too) I like the candy cane coloring of the younger one too That one's gonna be ready for a molt soon, judging by the toenails, so don't be surprised if he disappears on you. Congrats, they are gorgeous! Awesome! Keep those pics & updates coming! Wow, those are some beautiful Straws. I'm sure they'll grab up as much food as they can eat, and plenty of water and go down under for a nice relaxing molt. Heheh. I too love their shells. You have some really nice looking guys. Cool! Did you bathe them before they went into ISO? Is your salt water extra salty? Mmmmm! My straws love tomato! Do your Straws like tomato more than your PP's do? My PP's never seem to go for them when I have put them in.